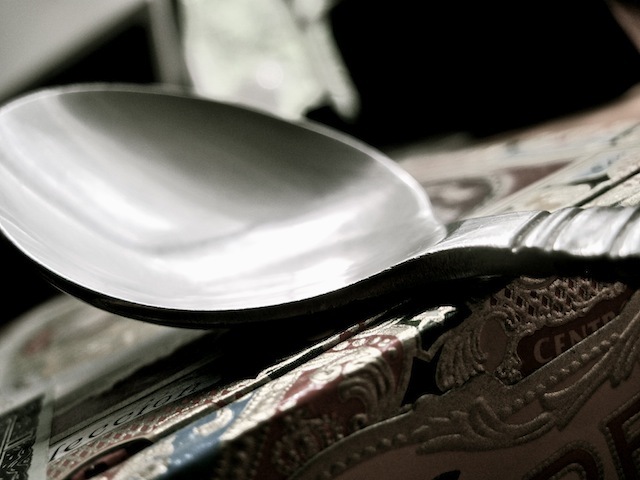 The Spoon Stands Alone – Eat Me. Drink Me. A fork is just a spoon with holes. How primitive, a set of little spears, to prod, poke, pierce, and rent. Where is the elegance of the spoon’s soft curve, the spoon’s caress of a pumpkin soup, its languid dive into pudding, the easy crunch with which it drops onto the caramel hat of a crème brulé. A fork is crude, a tine nothing more than a galvanized toothpick. Give me the heft of a spoon’s curved bowl cradled in the hand’s palm, the sensuous glide of the tongue beneath its cambered base, the upper lip’s sweep into the lightly sloping dip. How lovely, a piled stack of peas, pearls of tapioca suspended in pale pudding, a melting marble of ice cream lifted easily to the mouth in the safety of the spoon’s arms. A steak, you say? What good is a spoon for a steak? None; but for that I have my fingers. What is a fork, after all, but a bourgeois approximation of a hand? As if the hand were too delicate to grasp a breaded pork chop or a broccoli floret, as if the teeth weren’t meant to bite through veal or a tender medallion of filet mignon. There is that crassness in a fork, a pretension that one shouldn’t feel the food one eats, a pizza must be prod and cut before it can be chewed, a tomato surgically sliced. A fork is redundant as is a knife, but a spoon – a spoon extends the hand as if the palm were mirrored past the fingers. How painstaking it would be to lap milk from a bowl of cereal or eat yogurt one finger’s sweep at a time. A fork and knife are just reductions of what we already have; the spoon completes the hand. I have never looked at a spoon so poeticly before. I will now hold each spoon in my hand and mouth and think of a lovely ode to a spoon.